Sunrise sessions can be the best way to avoid the summer heat in South Florida, but this particular day was hot even before the sun's fiery face broke the surface of the Atlantic. These two handsome grooms didn't seem to notice, completely wrapped up in their love for each other. The color tonalities of this early morning light contrast and complement each other, with the cool blues and blacks offsetting the warmer plums and peaches. Silhouettes can be a beautiful way to incorporate lifestyle portraiture into your home as custom wall art, showcasing what’s essentially a landscape image with a very special bonus: the two of you interacting. Sunrise on Palm Beach Island is a quiet and relaxing scene: just a few early morning joggers running past. With very few high rise buildings on the island, the majority of the beach feels open and welcoming, allowing a wide range of options for poses, backgrounds, candid moments, and traditional portraits. 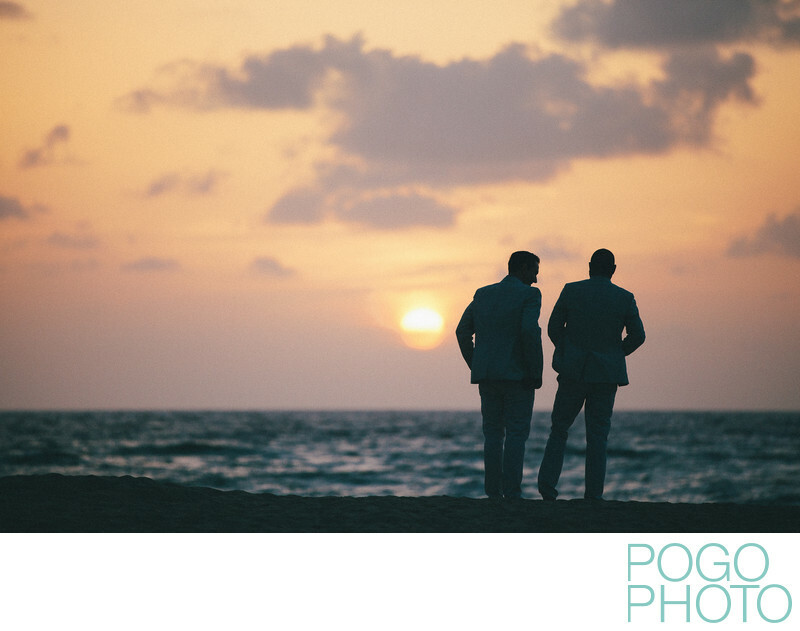 We love photographing gay wedding portraits on the beach, as nothing feels more effortlessly romantic and intimate. We next went over to the other side of the island to capture some images on the intracoastal waterway, with golden sunlight on the blue water and the brightly colored buildings of nearby West Palm Beach. Location: Palm Beach Island, Florida. 1/1600; f/2.8; ISO 400; 190.0 mm.